Cacciatore means "hunter" in Italian - Chicken alla Cacciatore means chicken cooked the hunters way, with peppers, onions, tomatoes, and wine. Now: I'd like for you all to envision me as Elmer Fudd, as I tip-toe to the refrigerator to "hunt" my chicken......be vewwy, vewwy quiet!! Just for the record, I DO have an Elmer Fudd winter hat. Depending on the region of Italy, lends different variations on ingredients; red vs white wine, regional cured meats, etc. I took 4 years of Italian in high school, the only things I remember are informal pleasantries (Ciao! Va bene! Non che male! ), mild curses (A Fa@&*), and the regional foods of Italy. 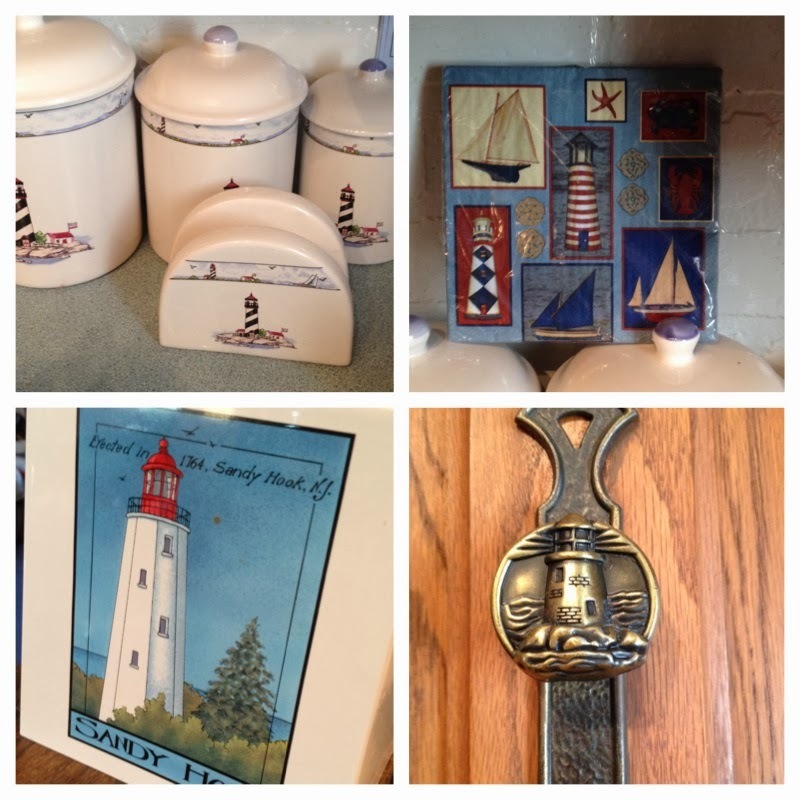 I mentioned it in the past few posts, Sean and I have been staying with my Mom & Dad.....their kitchen is VASTLY decorated with lighthouses(!!!!!!!!! )....but we'll get to that in just a minute. This dish was one of those we have X, Y, Z, and wine....what should we make? 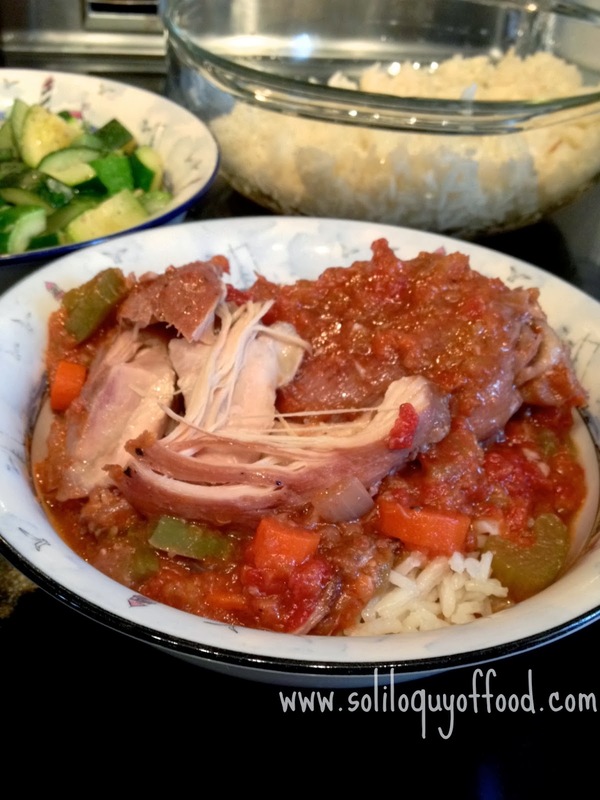 If your pantry is fully stocked you may have all that is needed to make this for dinner! I wanted more of a sauce, rather than the traditional chunky tomato vegetable mix. When the chicken was finished, I removed it and a bit of the vegetables, then pureed the rest. I served this with rice and pappardelle pasta (NOT pictured - but excellent with the sauce). 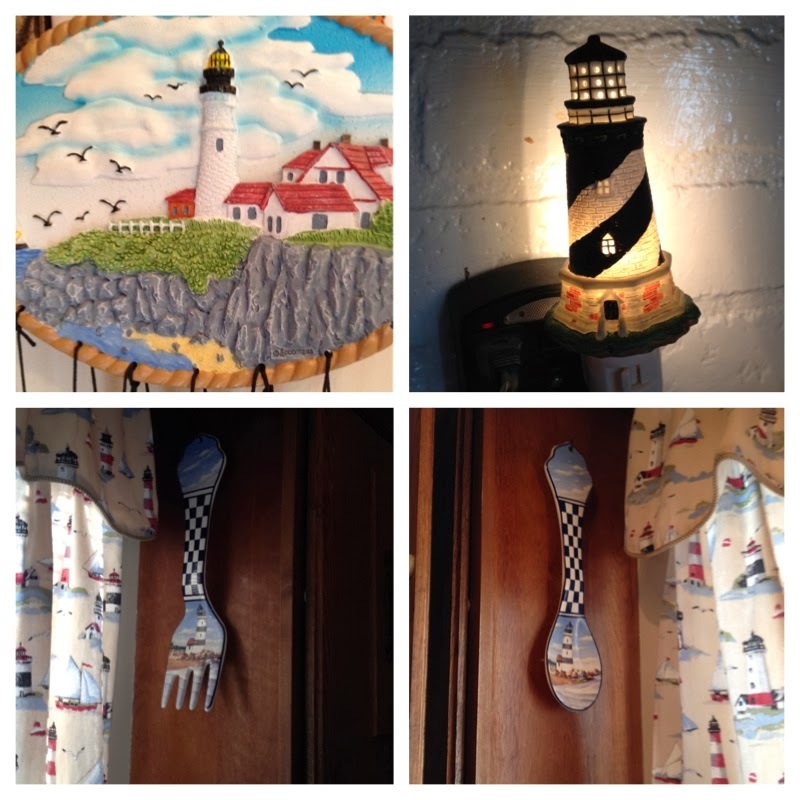 A lighthouse wind chime set (only indoors due to the inclement winter weather).....not to be outdone by the lighthouse nightlight....just in case you wander in the kitchen after dark, much like the Gorton Fisherman needing a beacon of light to find his way ashore. And the proverbial giant fork and spoon, just this one is, you guessed it,....lighthouse. Season the chicken thighs on both sides with salt and pepper. Heat a large skillet over medium heat. Sear chicken, brown 5 minutes on one side, flip and brown the other side for another 5 minutes. Add all the chopped vegetables, bay leaves and garlic - toss to coat in the chicken drippings, cook for 5-7 minutes until the vegetables are softened. Add the wine, cook down and reduce by half, another 5 minutes or so. When the wine is reduced add the canned tomatoes, reduce heat to low, cover and cook for about an hour. When ready to serve - remove the chicken pieces and about 1 cup of the tomato-vegetable mix, set aside. Puree the remaining tomato-vegetable mix in a blender - pulse 5-6 times until desired consistency. Add the puree back to the pan, stir in the chicken and chopped veggies. Serve over rice or pasta. Talk like Elmer Fudd. now that's the best looking cacciatore I have ever seen. Looks tasty! I have a thing for anything that includes bay leaf. It's a sickness. Maybe when you hold the lighthouse intervention, I can piggy-back on it? Thank you for linking, Kim. Looks delicious. Thanks for sharing on Sweet and Savoury Sundays, stop by and share with us again this weekend! Lighthouse hmm... I love them, but I'm not a collector of anything. 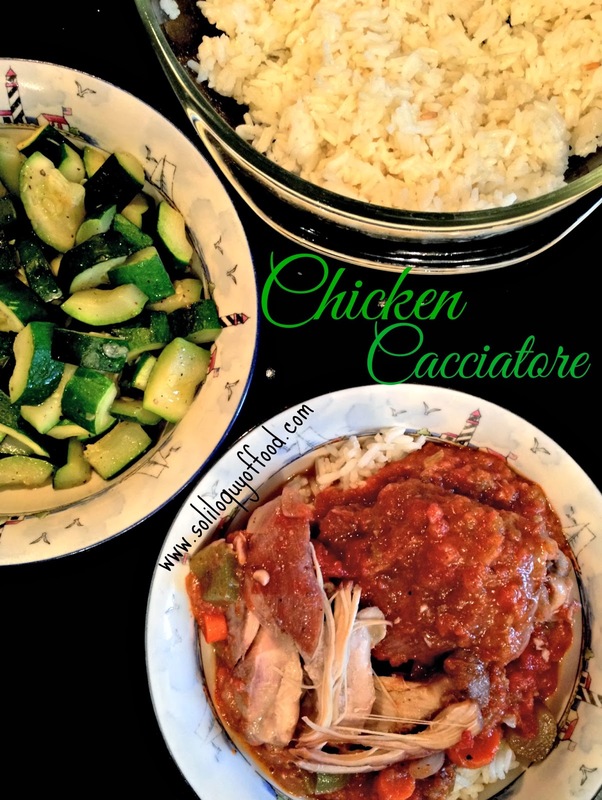 I didn't know that cacciatore meant hunter. I took a year of Italian and got it all mixed up with the Spanish I had been taking before... great recipe thanks for bringing it to foodie friday.